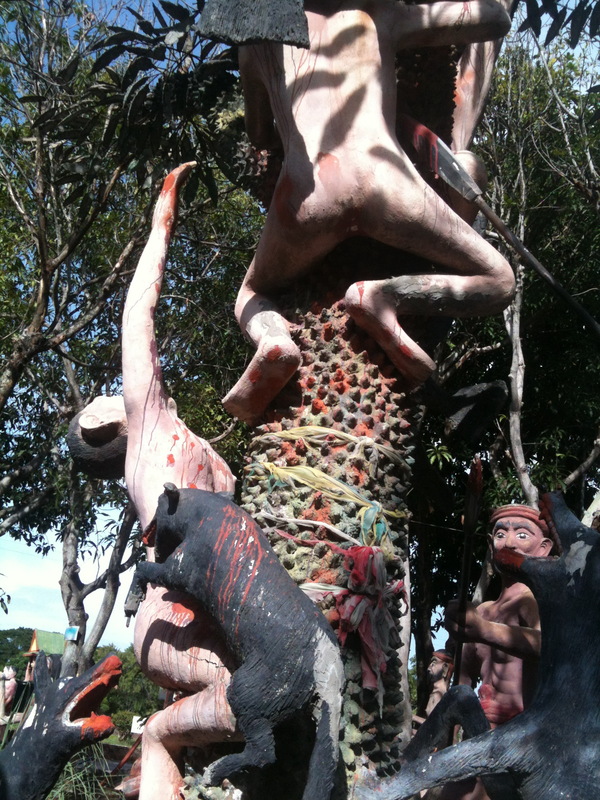 Buddhist Hell is a real place and you can visit several of them throughout Thailand. 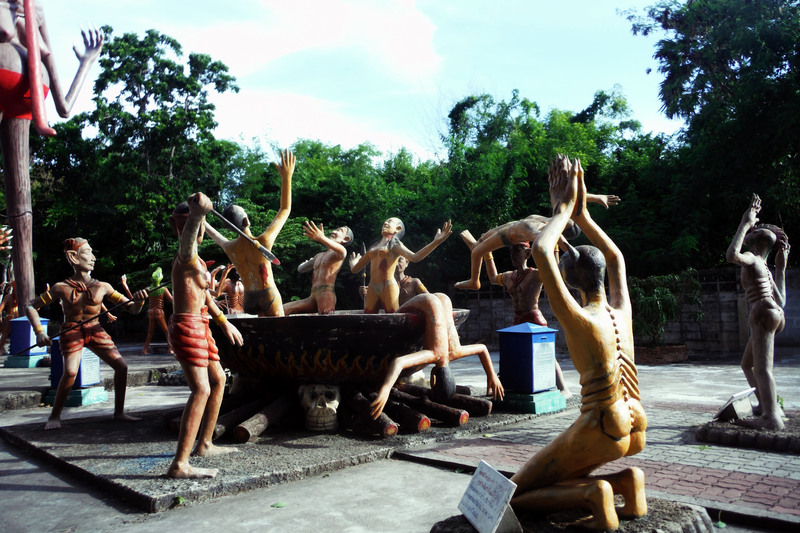 In a previous post, I took you through a Buddhist hell I stumbled across randomly while on a road trip in Khon Kaen. 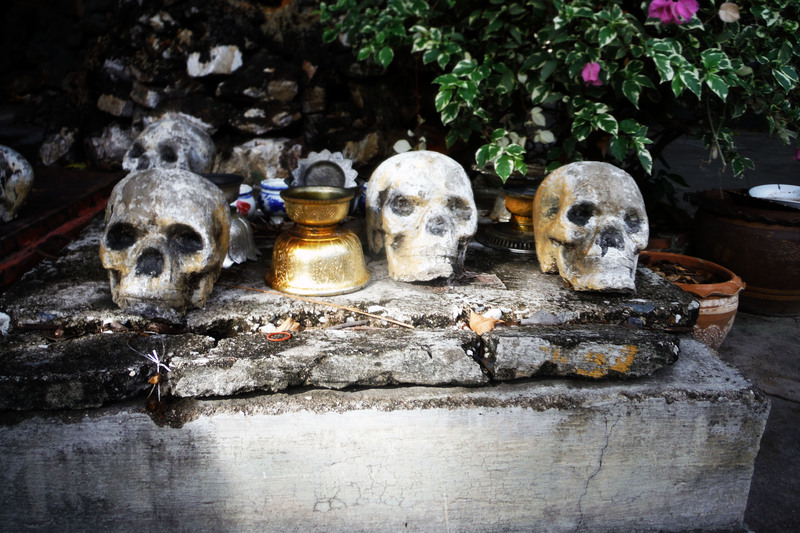 These hells are within Buddhist temples and are a reminder of what happens if you are a bad Buddhist. Every torturous scene depicts the hell that awaits you if you commit a certain sin. It’s so much fun! I’ve been dying to visit more hells and hadn’t had the chance. 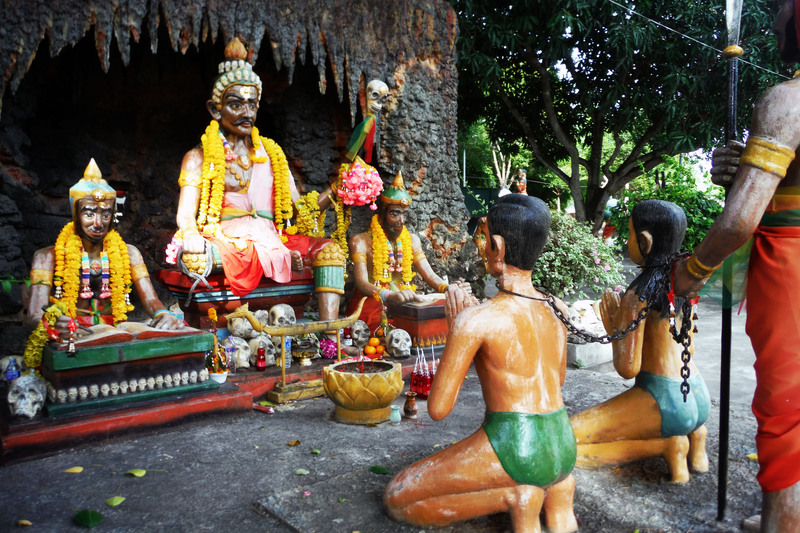 So this week while on vacation, I decided to finally cross another hell off my list, hop on a bus, and travel to Chonburi province, a little over an hour away from Bangkok, to visit the Wat Saen Suk (Hell Garden.) It did not disappoint. It was an amazing gruesome giant art installation plopped in a nice, quiet Thai residential area. It was hot as hell and I noticed there weren’t any taxis for miles, so I made sure the motorcycle taxi I rode on stayed put as I ran through the gates to snap pictures of purgatory. When you walk in, it’s impossible to miss these two gruesome giants with long tongues. 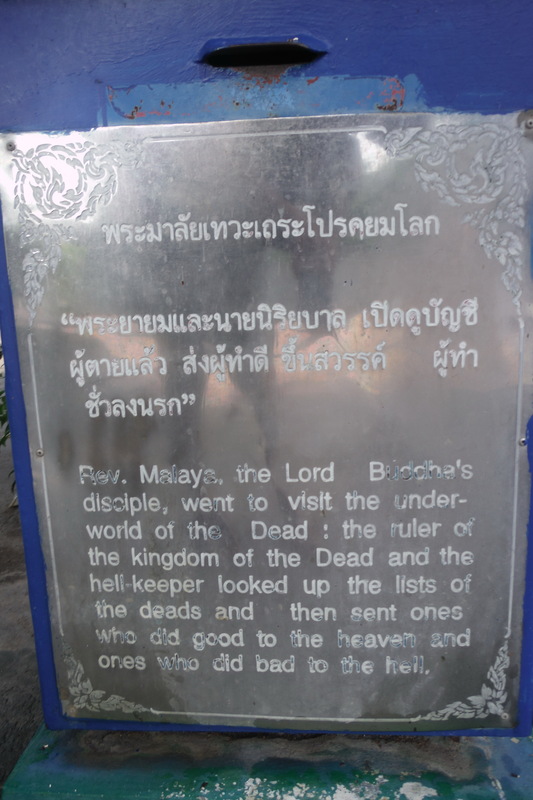 The great thing about this particular Buddhist hell is that there were signs in Thai and English to explain the meaning behind most of these sculptures. As much as I enjoy just walking into something cold and forming my own interpretation, being able to get the cultural meaning behind these particular works of art added to the experience. I love Thai English! And basically I saw my fate for being a hedonistic libertine. Actually most of these statues represent sins I commit on a regular basis. Surrounding the giant ghosts were tall humans with animal heads. Each animal represents a different sin. They could all easily be characters in a Carlton Mellick III novel. The curse of the “Cursetaceans.” New CM3 novel? Screencapped it from video, hence the hallucinogenic experience trying to read this. The hell for harming animals was very bloody. “Ones who violate the 5th one of the 5 precepts, drinking the intoxicants until not into control their mindfulness receive the results of the bad action shown in this picture.” That’s going to be everyone! The tree of adultery. Thailand is ranked as being the most adulterous country in the world. Abortion is technically illegal in Thailand and the most popular ghost stories involve the loss of a wanted or unwanted baby. A gallery of miscellaneous bizarre tortures for various sins. At the end of the tour, is a monk with many tortured souls begging for redemption. This monk went to the netherworld to “save the hell beings from the sin.” He came back and told their ancestors to make merits for the deceased. So you can be redeemed if you give the monks some money. Donation boxes are conveniently located throughout the park. This cool installation is at the beginning of the hell park but I didn’t notice it until the end because I wanted to get into the depths of hell upon arrival. This is the entrance to heaven or hell as decided by the hell keeper. Some cute hellish skulls next to the hell keeper. 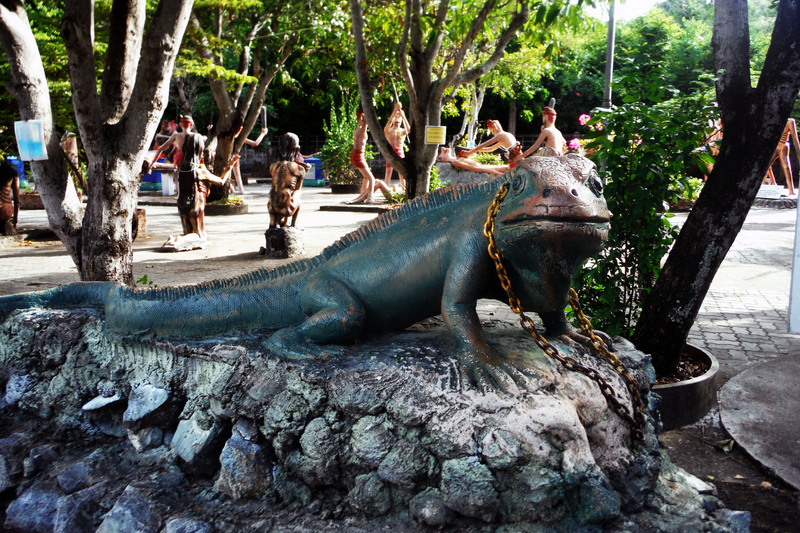 And a random iguana sporting a chain because this is Thailand. I hope you enjoyed this tour through a Buddhist hell. I’ve received leads on several more which are a reasonable bus distance away. More hell awaits! This entry was posted on August 12, 2015 by Tracy Vanity. It was filed under Tracy Vanity, Weird Pictures and was tagged with Buddhism, Buddhist Hell, Hell Garden, Thailand, travel, twisted tuesdays, Wat Saen Suk, weird places.